"Massachusetts Marriages, 1841-1915," database with images, FamilySearch (https://familysearch.org/ark:/61903/1:1:N4XD-8WZ : 17 February 2016), Earl Franklin Larrabee and Helen Camille Jackson, 01 Jan 1915; citing Medford, , Massachusetts, United States, State Archives, Boston; FHL microfilm 2,411,236. "United States Census, 1900," database with images, FamilySearch (https://familysearch.org/pal:/MM9.3.1/TH-267-12046-21808-44?cc=1325221 : 5 August 2014), Maine > Cumberland > ED 75 Portland city Ward 8 > image 27 of 62; citing NARA microfilm publication T623 (Washington, D.C.: National Archives and Records Administration, n.d.). 1880 United States. Census Office. 10th census, 1880 federal population census, Washington, District of Columbia: National Archives and Records Service, ([19--]) , FHL Film 1254477; National Archives Film T9-0477; Page 40C. "Maine Vital Records, 1670-1907 ," database with images, FamilySearch (https://familysearch.org/pal:/MM9.3.1/TH-1-10122-102713-30?cc=1803978 : 20 May 2014), Vital records 1892-1907 > Lapierre-Lavoie > image 1245 of 4253; State Board of Health, Augusta. Addison A. Latham was born on June 15, 1814 in Saint Johnsbury, Caledonia County, Vermont. Addison married Abigail Bartlett Holt, daughter of Daniel Holt and Mary or Polly Hale, in 1836. Addison died on January 12, 1873 in Yarmouth, Cumberland County, Maine, at age 58. Find A Grave Memorial# 41929850. Find A Grave Memorial# 41929849. "United States Census, 1880," database with images, FamilySearch (https://familysearch.org/pal:/MM9.3.1/TH-1942-25161-19833-57?cc=1417683 : 24 December 2015), Maine > Penobscot > Bangor > ED 31 > image 8 of 53; citing NARA microfilm publication T9 (Washington, D.C.: National Archives and Records Administration, n.d.). Nahum Mitchel, History of the Early Settlement of Bridgewater in Plymouth County, Massachusetts, , at https://books.google.com/books?id=KIc-AAAAYAAJ . Bridgewater, Massachusetts: Henry T. Pratt, (1897) , p. 170. Vital records of Bridgewater, Massachusetts, to the year 1850, Boston, Massachusetts: New England Historic Genealogical Society, (1916) , Vol. 2, p. 144. She was the daughter of Addison A. Latham and Abigail Bartlett Holt. 1850 United States. Census Office. 7th census, Population schedules of the seventh census of the United States, 1850, Washington, District of Columbia: National Archives. Central Plains Region, (1964) , Census Place: Norway, Oxford, Maine; Roll: M432_263; Page: 53B; Image: 107. He was the son of Addison A. Latham and Abigail Bartlett Holt. Find A Grave Memorial# 41929848. Vital Records of East Bridgewater, Massachusetts, to the year 1850, , at https://archive.org/details/vitalrecordsofea00eas . Boston, Mass. 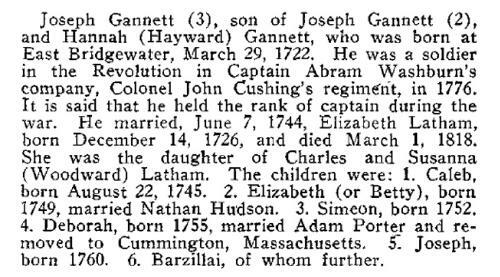 : New England Genealogical Historic Society at the charge of the Eddy Town-Record Fund, (1917) , p. 209. Williams Latham, Epitaphs in Old Bridgewater, Massachusetts, , at https://books.google.com/books?id=WZclAQAAMAAJ . Bridgewater, Mass. : (1882) , p. 212.
living at Ward 2, Dayton, Montgomery County, Ohio. 1880 United States. Census Office. 10th census, 1880 federal population census, Washington, District of Columbia: National Archives and Records Service, ([19--]) , FHL Film 1254486; National Archives Film T9-0486; Page 244D. Date conjecture by GenSmarts, (GenSmarts is a trademark of Underwood Innovations, LLC),. 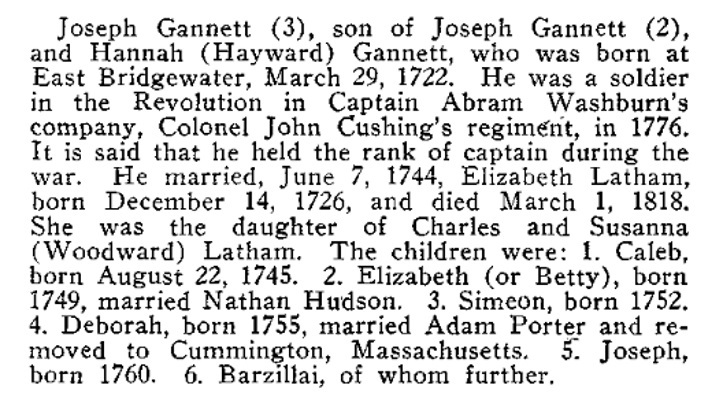 George Lawrence was born perhaps about 1717. William Richard Cutter, Genealogical and personal memoirs relating to the families of Boston and eastern Massachusetts, Vol. 1, , at https://books.google.com/books?id=OU0k2d8nl3IC . New York: Lewis historical Pub. Co., (1908) , p. 238.
living at 47 Milton St., Dedham, Massachusetts. Sixteenth Census of the United States, 1940, Washington, D.C.: National Archives and Records Administration, (1940) , Census Place: Dedham, Norfolk, Massachusetts; Roll: T627_1627; Page: 3A; Enumeration District: 11-92. 1930 United States. Bureau of the Census. 15th census, United States, 1930 federal census : population schedules ; NARA microfilm publication T626, Washington, District of Columbia: Bureau of the Census Micro-Film Laboratory, ([19--?]) , Census Place: Quincy, Norfolk, Massachusetts; Roll: 936; Page: 17B; Enumeration District: 0108; Image: 888.0; FHL microfilm: 2340671.